Store-Safe’s toolboxes fit housed tools. Store-Safe has expanded its toolbox range to cater for the growing use of housed tools, especially for tradesmen that use ute boxes. Angle grinders, drill sets, jigsaw kits, and other electrical tools are now contained in carry cases. 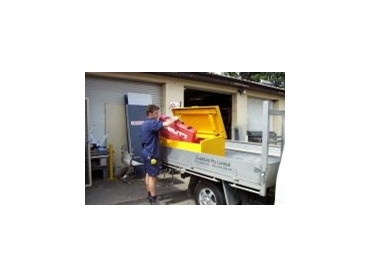 Store-Safe is manufacturing an additional series of deeper and wider ute boxes. They are 550mm wide and can take up to six cases of various power tools, with enough space to store a range of loose tools and equipment. 1m, 1.2m, and 1.7m long cases are available. The toolboxes are manufactured using strengthened 3mm steel and feature internal hinges and a registered key system. They fit neatly onto the back of a ute.